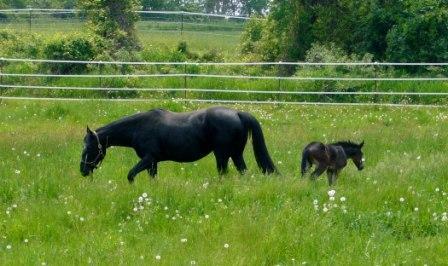 Deerpath provides services for high risk and special needs mare care and foaling. Our experience and education allow us to provide peace of mind. As well we work closely with our veterinarians in a team setting in order to provide for the needs of the mare and foal. Stalls are video and audio monitored and Robert lives on the premises. In order for a foal to grow to its full potential it is important to start with care while it is still in the mare. This involves proper mare care, involving nutrition and preventitive health care. When the foal arrives, mare nutrition continues to be important, as well the foal requires a program of its own in order to ensure it develops properly. 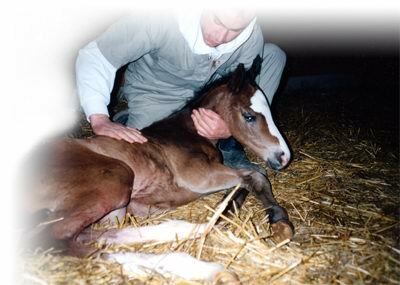 Proper daily handling, nutrition and preventive health care are essential to a foals development. We also can go to your farm and set up a mare and foal program for you.